Congratulations on your purchase of a fine quality product! 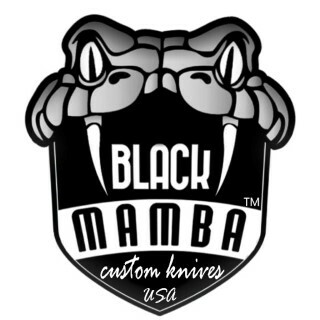 BLACK MAMBA KNIVES offers a dependable Lifetime Limited Warranty on all first quality knives. First quality BLACK MAMBA knives are covered against any manufacturer defects in materials or workmanship, ie blade cracks ,handle cracks, chips, rivet comes out, steel hardness, etc. The Lifetime Limited Warranty covers regular use of the knife and normal cutting and slicing of hides/meats/food for that particular style of knife. Return all parts and pieces to the factory for inspection. See RETURNS below for more info. If found to be covered under warranty, BLACK MAMBA will at their discretion, recondition, adjust or replace it with the same item or closest item available at the time..
Warranty is voided if any signs of abuse: bends/twisted blades, rusted out blades/liners, burns or hammer marks, ground down or dismantled knives; modification outside of the factory including blade overheating & breakage, self-made kits, or knives that are completely worn out. With normal use you will have a fine quality BLACK MAMBA product that will serve you well for a lifetime! To return a knife for any reason, be sure to include all parts and pieces if broken/damaged. mailing, be sure to wrap well and include a note with your name, address, phone number and reason for return or work to be done. After getting the knife back we will issued full refund. INTERNATIONAL: If mailing from outside of USA be sure your package is labelled correctly as a ” Return to Manufacturer Free Domicile” is clearly marked, or checked off. Any parcels that arrive at the border with charges owing on it, improperly filled out customs forms, taxes, etc will not be forwarded to us, they will be refused/returned to you. Shipping insured parcel post is usually the cheapest and easiest. But if using a courier such as Fedex, Purolator, DHL etc again, be sure to mark it “Defective return to manufacturer/FREE DOMICILE” on your waybill or it will be rejected at the border. All shipping and affiliated charges of the package are the responsibility of the shipper. COD’s or collect shipments will be rejected at the receiving station.